As your friends indulge in this gooey, cheesy, yummy appetizer, they will never guess that it only takes about 10 minutes to make. It’s become a Super Bowl staple, an easy treat for family get-togethers, and a hit with my book club. And really, it’s so easy. 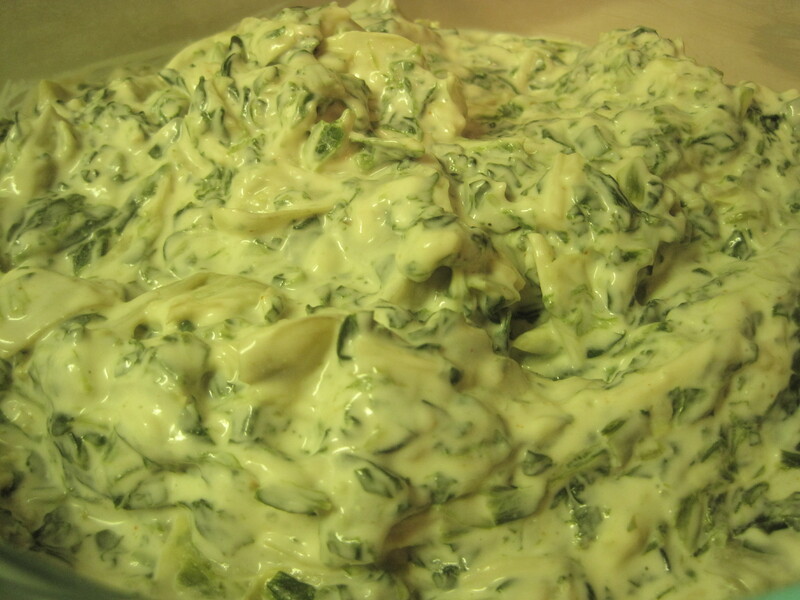 This little kick of cayenne makes this seemingly ordinary Spinach Artichoke Dip extraordinary. 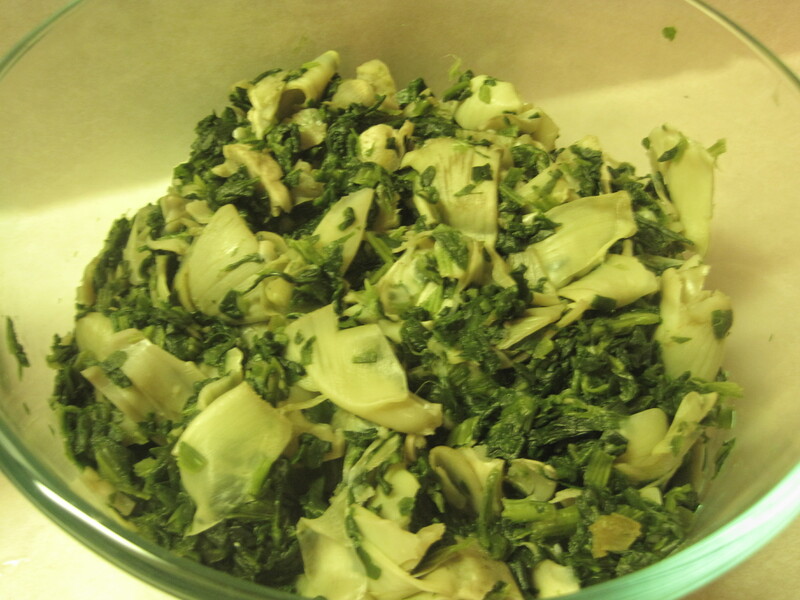 In a large microwave safe bowl, defrost your spinach and artichoke hearts together. You’ll do this by adding about 2 tablespoons of water to the bowl, microwaving on high for 5 minutes, stirring, and then microwaving again on high for about 3 minutes. Drain out any liquid. The best part of this dish is that it's a one-pot wonder. The defrosting is done in this dish, and then everything else is just added in. I even use my glass microwave-safe dish as my serving dish! If your artichoke hearts are too big in size, break them apart with a fork. 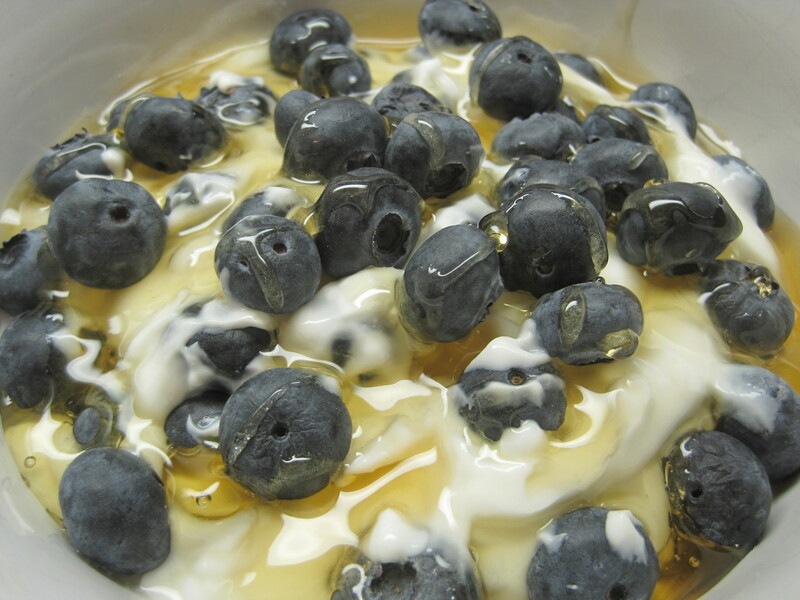 Stir the cream cheese in with the hot mixture. Then add the sour cream, mayo, Parmesan cheese, cayenne pepper, salt, and garlic (I use low-fat versions of the ingredients if I can so that I feel less guilty about enjoying scoop after scoop of this, but feel free to use full fat if you’d like). Stir until thoroughly combined. Serve hot with pita chips, crackers, or chunks of bread to scoop up the goodness. 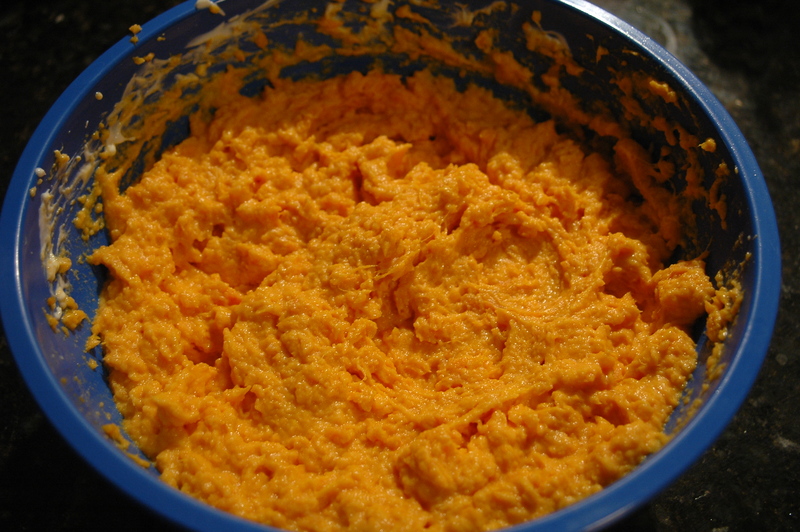 This can be stored in the fridge overnight and reheated the next day (reheat by microwaving on high for about 3 minutes, and then stirring to combine). Enjoy! Easy has never tasted so indulgent. This yummy, gooey, smokey dish is the ultimate weeknight treat. It’s loaded with rich, creamy blue cheese which pairs perfectly with the smokey bacon, and it’s packed with a huge serving of spinach (so you don’t have to feel too guilty, right?). And it’s so simple! While the ingredients aren’t necessarily on my kitchen staples list, you’ll almost always find them in my fridge. Instead of cooking bacon, I take the easy way out and use bacon bits or bacon pieces. These last in the fridge for a long time and are great on salads, BLTs, or in mac ‘n cheese. Blue cheese can last for months, and again is great in salads or crusted on steak. And the spinach is just a pack of steamable frozen spinach that can be used in meals like this or as a simple side dish to another meal. The options with these ingredients is endless! So don’t feel guilty about beefing up your kitchen staples list with these yummy goodies. I paired my yummy chicken with a simple quinoa side (or you can do rice or potatoes). 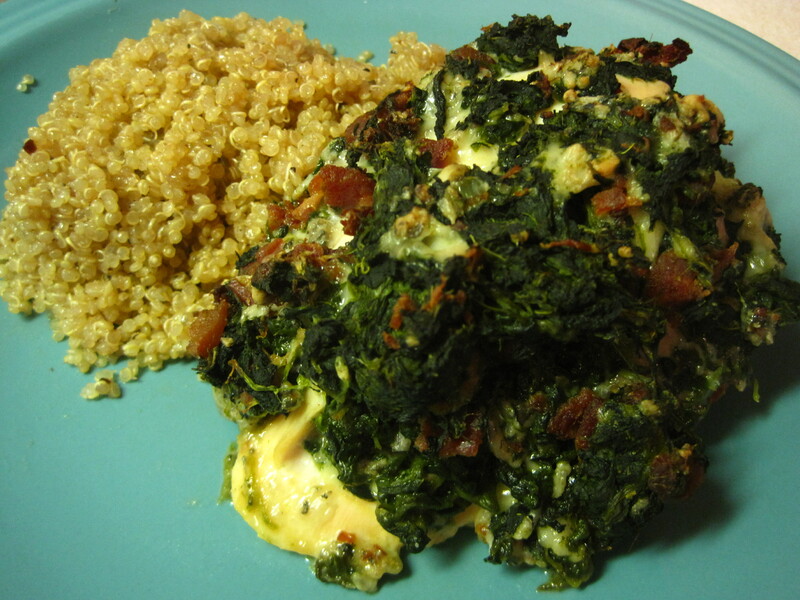 Since you're loading the chicken with so much spinach, you don't really need a separate veggie side. Start by preheating your oven to 350 degrees. Then, get your chicken defrosting in a bowl of water (see “Let’s Talk Chicken” for defrosting instructions) – if your chicken is fresh, not frozen, put the chicken aside until your stuffing is ready. While your chicken defrosts, cook your spinach in the microwave by following the instructions on the package. Once the spinach is cooked, squeeze out any water. 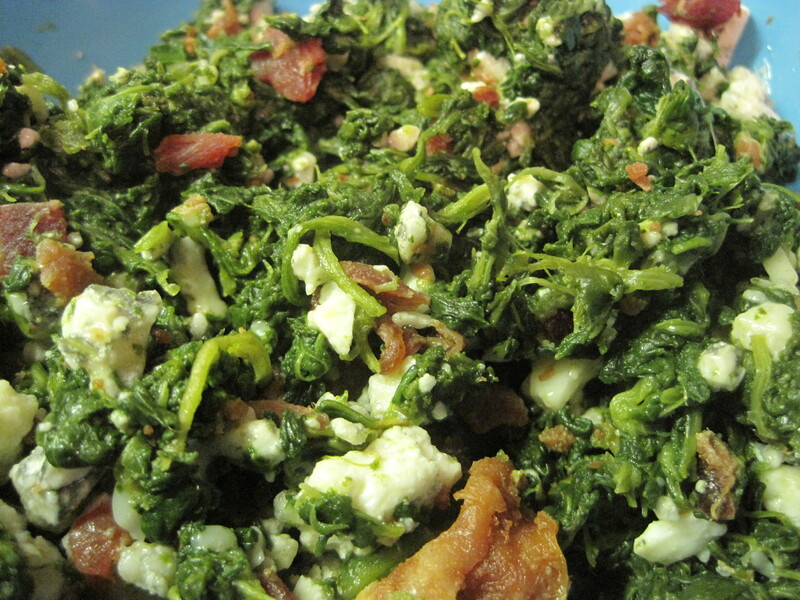 Mix the blue cheese and bacon with the cooked spinach in a medium bowl. Since the spinach will be hot, your blue cheese will start to get all melted and creamy before you even put it in the oven. After your chicken is completely defrosted, slice it open across the middle to create a pocket for the stuffing. Then, put your chicken in a baking pan so it can be stuffed. 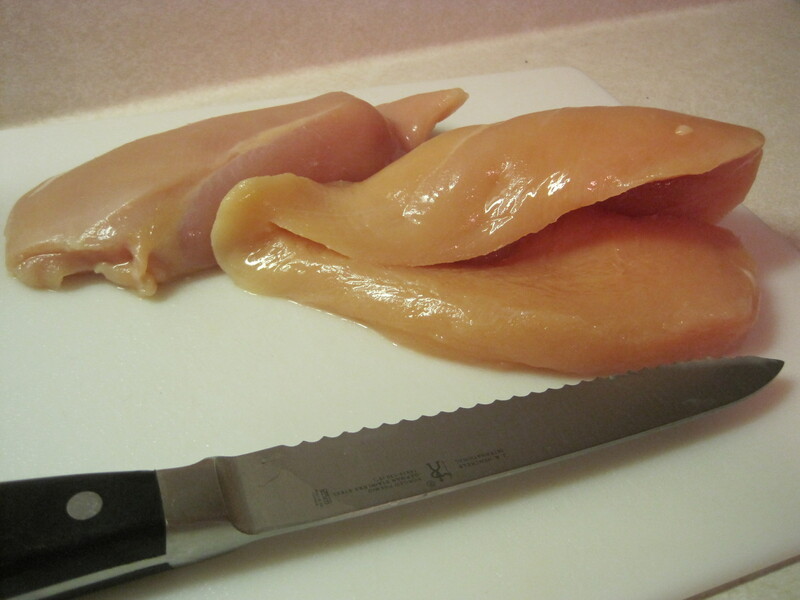 Don't cut the chicken all the way through, think of it like a pocket. 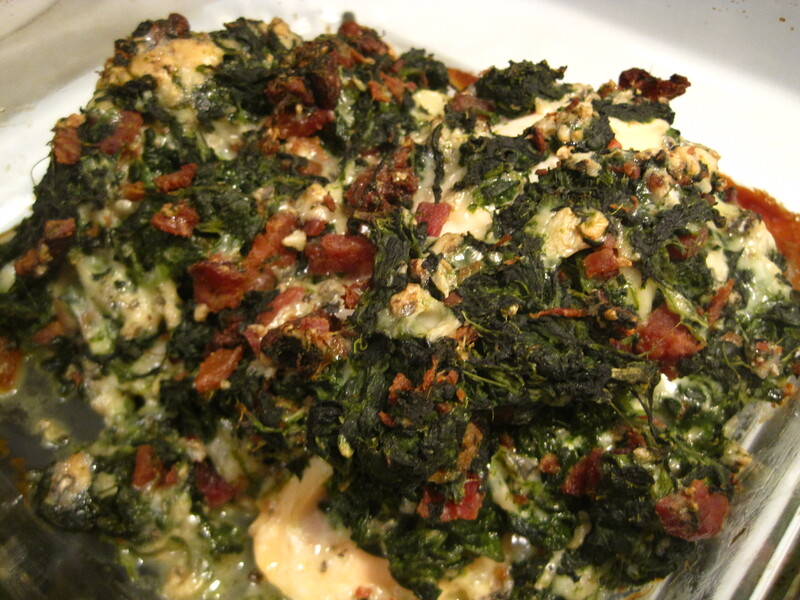 Stuff your chicken as full as it can get with your bacon, blue cheese, and spinach stuffing. I go a little heavy on the stuffing in this recipe, so I smother the top of the chicken with whatever I have leftover. Bake for 30 minutes. And before you know it, you’ll enjoying forkfuls after forkfuls of this delectable dish. I can barely wait for this dish to cool long enough to eat without burning myself. I always buy a big bunch of bananas with the best intentions of eating all of them. But I always forget that I like bananas best when they’re bright yellow with a slight twinge of green. And by day 7, whatever bananas I have left are slightly brown and spotted. While these are not my ideal bananas to eat individually, these bananas are prime for banana bread. So, after years of buying big bunches of bananas with the best intentions, I always inevitably end up with at least 2 bananas left to make a loaf banana bread. 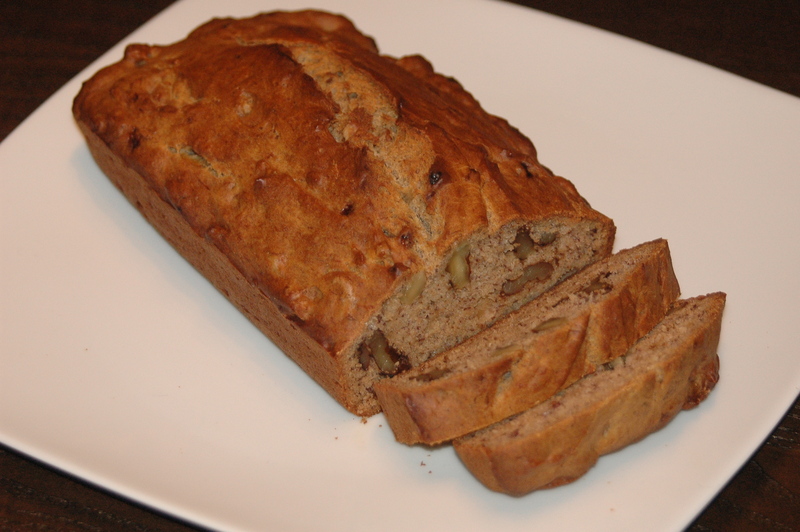 Banana bread is such a delicious, easy way to use up ripe bananas before they go bad. Plus, you've just made an extra-special breakfast for the week! See those spotty bananas? Those are perfect banana bread bananas. In a medium bowl, combine your flour, baking soda, baking powder, and salt. In a large bowl, cream together your eggs and sugar (meaning, beat those eggs and sugar on high for a couple minutes with an electric beater; or if you don’t have an electric beater then use a whisk to whip them together until thoroughly combined). Stir in mashed bananas (or, you could add them in and mash them as you go), vanilla, vegetable oil, and cinnamon. I like to leave my bananas a little chunky in the wet mixture because it gives you a little pop of pure, yummy banana flavor when you bite into the bread. Those chunks of bananas are what make your banana bread extra special! Slowly stir the dry mixture into the wet mixture, adding 1/3 of the dry mixture at a time. 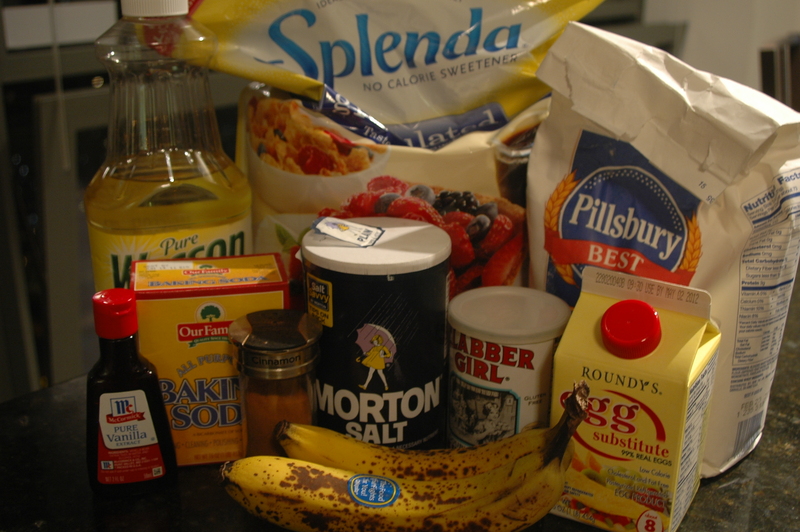 Combine the two mixtures until just combined – don’t over-mix, you want to leave some chunks of banana! Lastly, stir in your chopped walnuts. 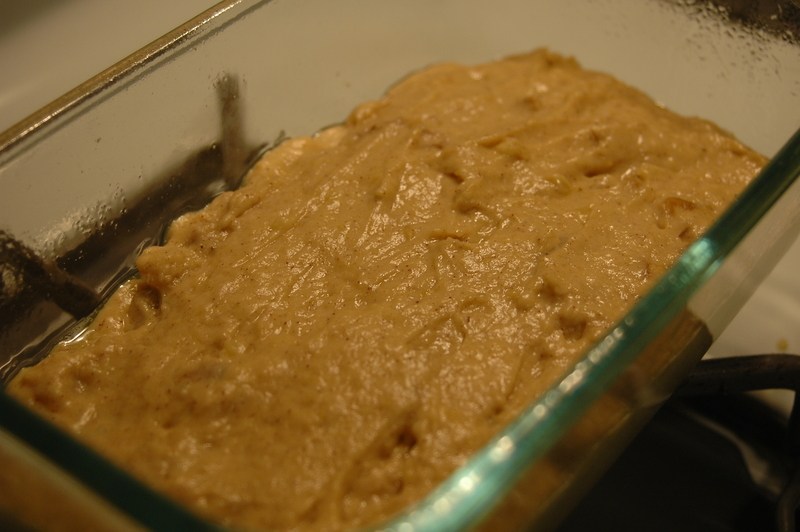 Pour into a loaf pan and bake for 45 minutes. Then, use the toothpick trick to check if your bread is done (if the toothpick comes out smoothly, it’s done; if it comes out wet, stick your loaf back in the oven for a few minutes and then re-test). The dough is ready to go in the pan. You can see little chunks of banana, chopped walnuts, and speckled with cinnamon. It's definitely a long 45 minute wait! After the bread is finished, I cut it up in slices, cover the pieces with plastic wrap, and then enjoy all week for an easy breakfast on the go! Potatoes are my ultimate comfort food. I’ll take them any way I can get them, in any variety of potato. I like them as fries, hash browns, chips, country-style, scalloped, mashed, or baked; and I like them sweet, russet, or red. Basically, I love potatoes the way Bubba from Forrest Gump loves shrimp. And what’s not to love? They’re good for breakfast, for dinner, as a side dish, or as a main dish. In the oven: The total cook time may be over an hour, but total time spent on it is about 5 minutes. It’s a great Thursday night meal when you’re exhausted from the almost-finished work week, giving you time to veg out in front of the TV while your oven does most of the work. In the microwave: Though I prefer my potatoes oven-baked, this is for when you’re starving and need to eat 5 minutes ago. 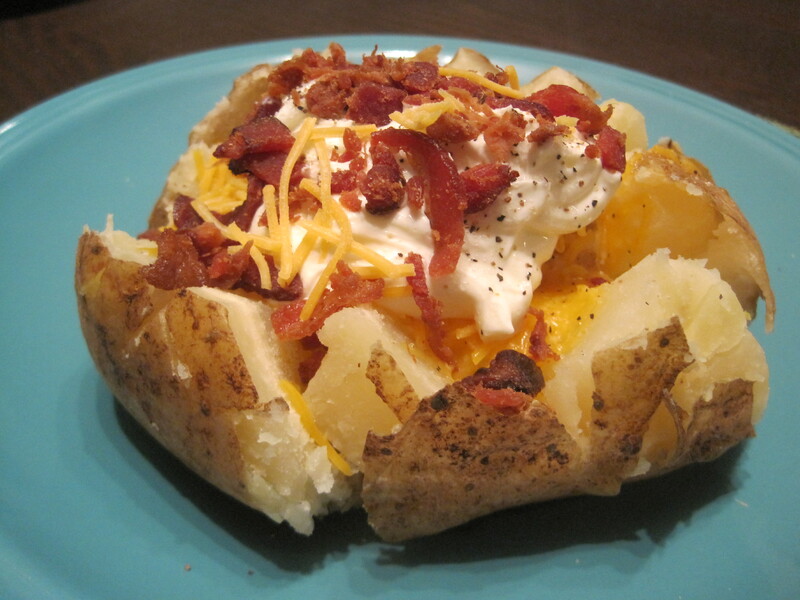 You can't get much more comfort food with this easy baked potato. Not only is it a potato, but it's dripping with cheese and bacon bits. But before we even get into how to cook it, let’s talk about how to choose a good potato versus a bad potato. When choosing a good potato, start with weight: find a potato that feels heavy. 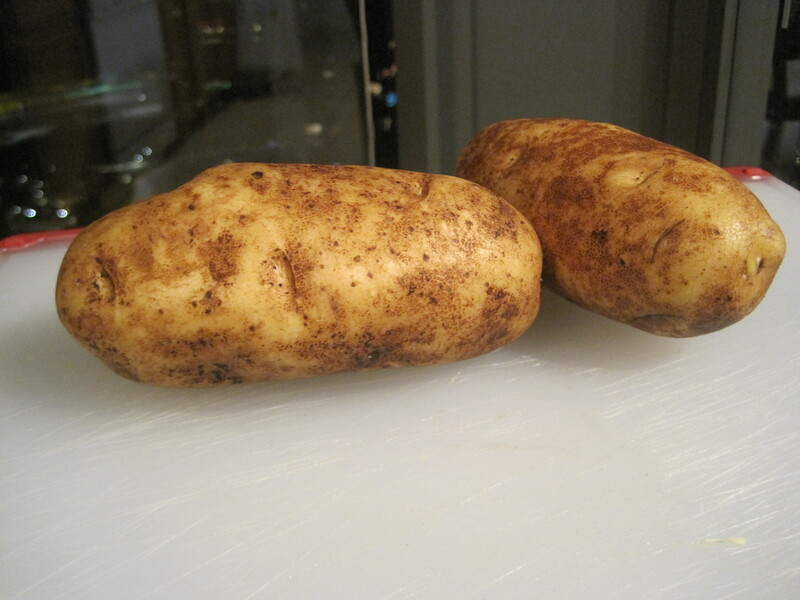 Once you found your heavy potato, look for a potato that is the most uniform in size and that has a nice oval shape. Avoid potatoes with blemishes, sunken spots, or decayed areas (usually found near the ends). Preheat your oven to 350 degrees. While it heats, scrub your potato nice and clean with a scrub brush. Then, use your paring knife to remove any imperfections – don’t forget you’ll be eating the skin (where Mom says all the vitamins are), so you don’t want any extra dirt or yucky stuff on there! Lastly, stab your potato all over with a fork to help it cook all the way through (about 10 times or until you have all your aggression out), wrap in aluminum foil, and stick it in the oven. Cook for an hour and 15 minutes. Clean your potato and stab with a fork as described above, and then wrap in a wet paper towel (no aluminum foil in the microwave!). Cook on high for about 10 minutes. When your potato is done (no matter how you cook it), slice multiple diagonal lines across the top of the potato (kind of similarly to the top of a loaf of bread), and then go back and slice diagonally across the top in the opposite direction – it’ll look like a diamond pattern across the top of the potato. This makes it easier to open the potato to stuff if full of all your goodies. Tips for stuffing your potato with goodies: Make sure to stuff your potato with the goodies you want melted first. So I always add butter first, then cheese (because I want those melted) before I add the sour cream, bacon bits, and whatever else doesn’t need to be melted. While cheese on top of the sour cream probably looks prettier, it doesn’t get that gooey goodness that takes this to comfort food status. 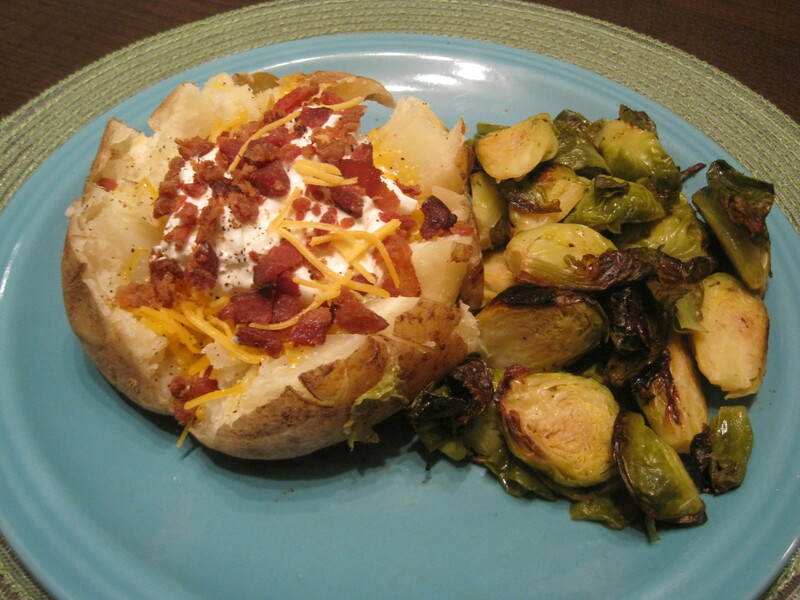 I paired this easy baked potato with my "Brussels Sprouts with a Kick" for a simple, yummy, weeknight dinner. I admit, I’m a tiny bit of a beer snob, so I love it whenever I get a chance to use beer in my cooking – not to mention, it’s a great excuse to enjoy a beer on the side while I cook! Guinness already has chocolate and coffee notes, so it pairs perfectly in a chocolate cupcake. These are rich, deep, decadent goodies that are great for beer-snobs and chocolate-snobs alike. What’s also awesome, these are easy enough to make to satisfy a craving whenever it hits. Even though baked goods are probably my favorite thing in the world to eat, I’m notoriously impatient when it comes to the actually-doing-it-and-baking part. These don’t require any complicated baking technique, and I make it even easier by buying my frosting in a jar (gasp!) and just jazzing it up to fit the occasion. 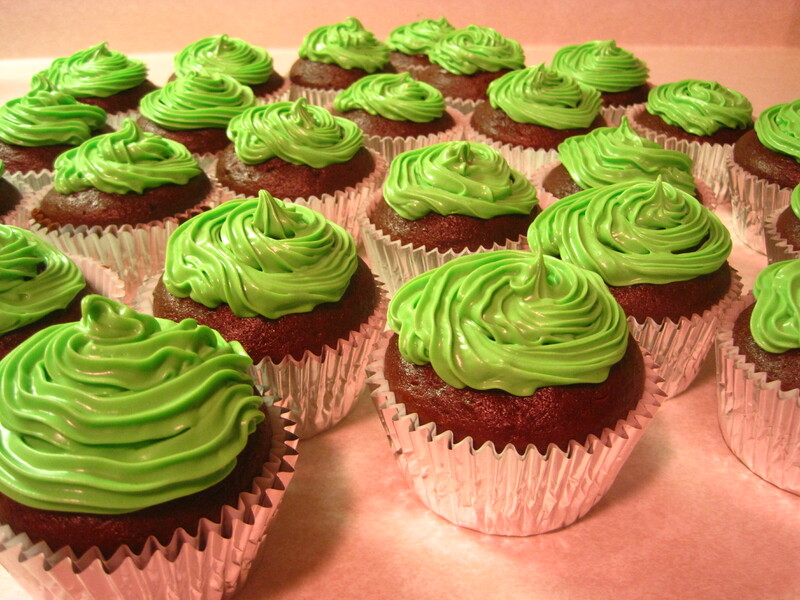 That hint of Guinness really gives these cupcakes a fun twist! 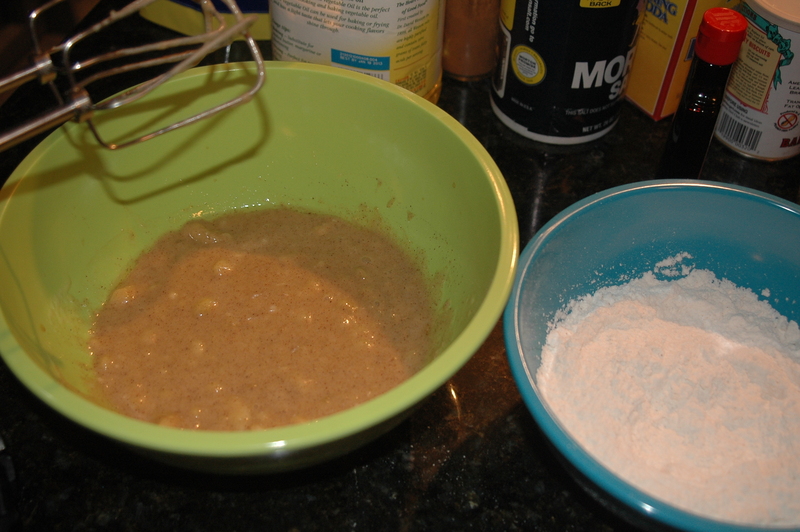 In a medium mixing bowl, combine the flour, sugar, cocoa, baking soda, and salt. Set aside. 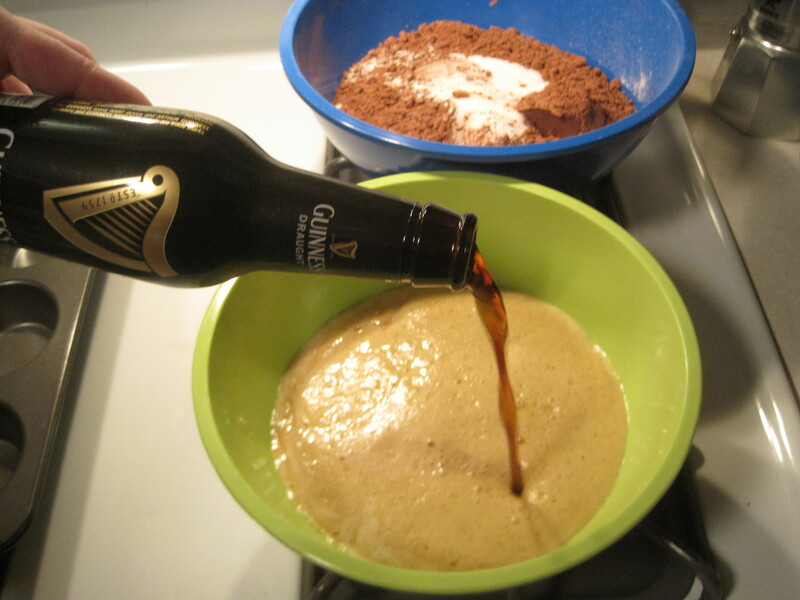 In a large mixing bowl, combine the Guinness, melted butter, and vanilla. Beat in the eggs, one at a time. Then, mix in the sour cream until thoroughly combined and smooth (I used my electric hand mixer, but if you don’t have one handy then use a whisk). The carbonation in the beer makes these cupcakes particularly light and fluffy. Slowly add the dry ingredients to the wet ingredients, adding about 1/3 of the mixture at a time. 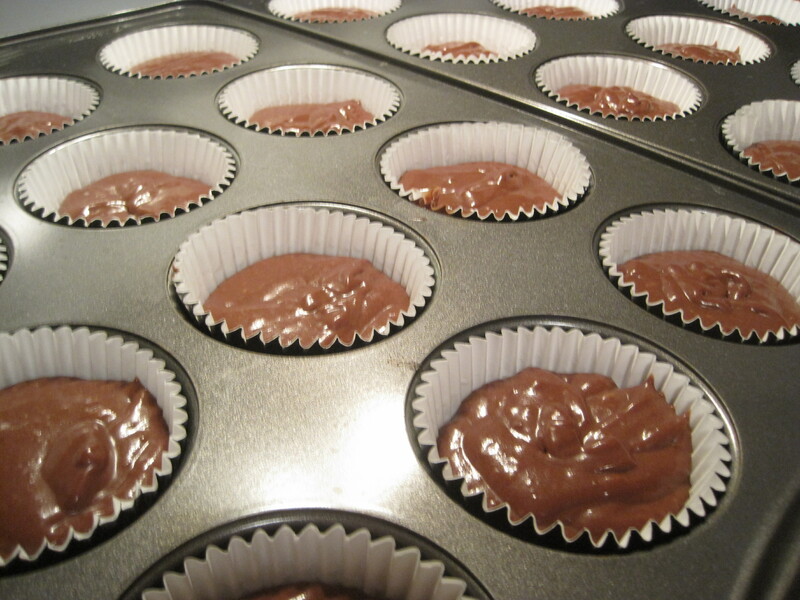 Line your cupcake pan, and then fill the cupcake wrappers until they’re about 3/4 full. I generally use a 1/2 cup measuring cup to fill my cupcake pans to keep the amounts even, but you can use more or less if needed. Bake for 12 minutes until risen and domed in the middle. I always use the toothpick test to make sure they’re done. If the toothpick comes out clean, your cupcakes are good to go. If the toothpick comes out wet, stick your cupcakes back in for a couple minutes and then check again with another toothpick. Dump the cooked cupcakes out of the pans after only a few minutes. Otherwise, they'll keep cooking in the hot pans. 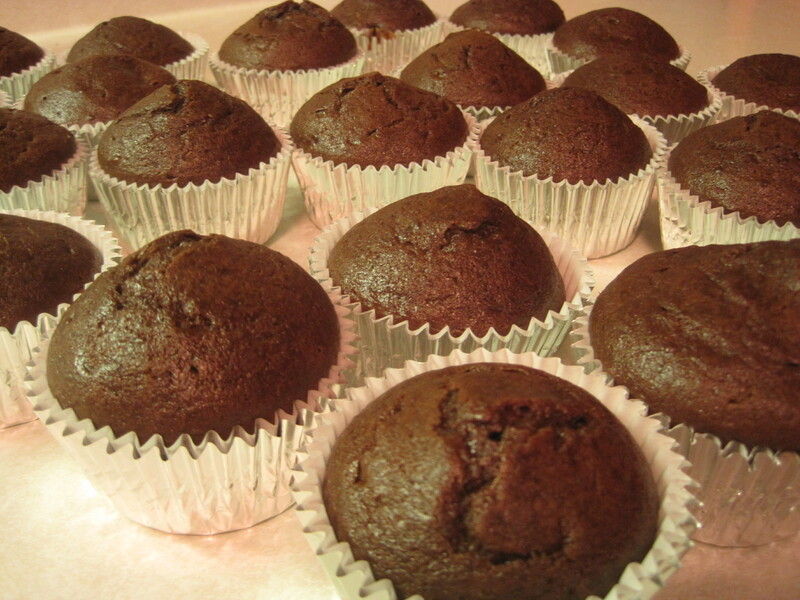 Once your cupcakes are done, turn out and let them cool completely before frosting. 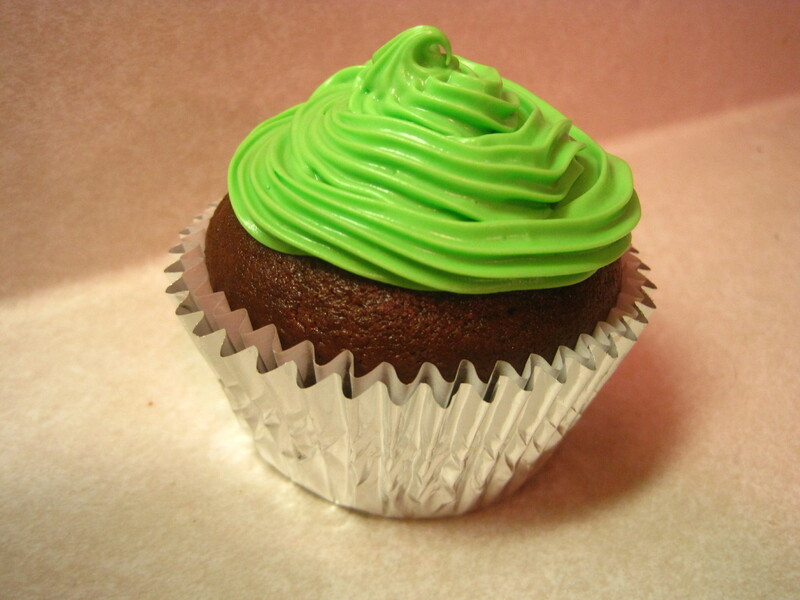 Speaking of frosting… I know I went the easy way out with frosting this time, but that’s okay! To jazz it up, I add food coloring to make it special. With St. Patrick’s Day coming up, I make it a bright green. Then go nuts with sprinkles, toppings (chocolate chips mixed in with the frosting would also be super tasty), or whatever sounds good to you! Festive for St. Patrick's Day! St. Patrick’s Day is one of my favorite holidays. I’m not sure if it’s because of my Irish heritage, if it’s because the city I live in gets so swept up in the holiday (they dye the river green, for goodness sake), or if it’s because I finally have an excuse to eat potatoes and drink beer all day without judgment. Either way, I always go all out. And St. Patrick’s Day wouldn’t be St. Patrick’s Day without some delicious shepherd’s pie. This shepherd’s pie, however, is a little nontraditional. It’s actually a slightly healthier spin on the more conventional shepherd’s pie, which is loaded with white potatoes and lamb. 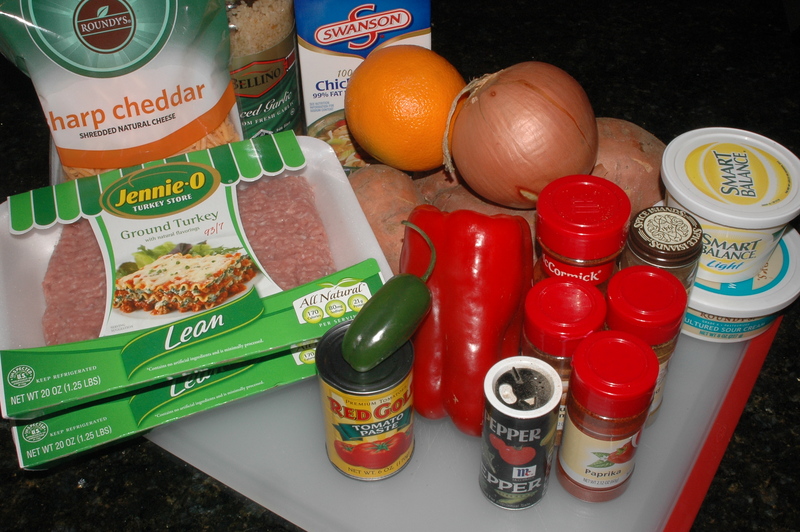 Instead, I use the nutrient-loaded sweet potatoes and lean ground turkey. Not only that, but the depth of flavor in this dish is unbelievable. It’s spicy, sweet, creamy, crunchy, cheesy, and with a hint of citrus. It’s to die for. 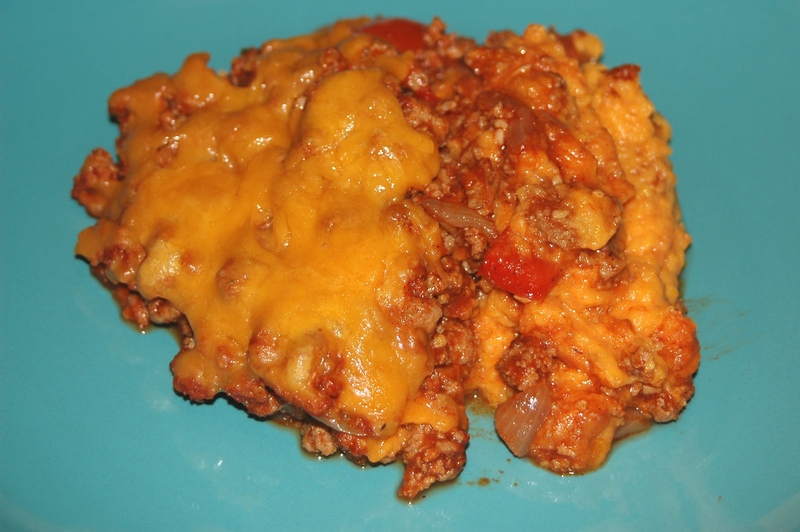 Potatoes, chili, and cheese? It's comfort food in a pan. Get all your ingredients ready to go, because once you start you won't have much downtime with this dish! Start by putting a large pot of water on the stove to boil and preheating your oven to 400 degrees. Then, peel your sweet potatoes and cut them into manageable cubes so they’ll cook faster (about 2 inches in diameter will do just fine). Once they’re cubed, get them in the pot of boiling water. While the potatoes cook, put your ground turkey in a very large pan sprayed with cooking spray over high heat and break apart with a wooden spoon. Seriously, use the biggest pan you have or you’ll run out of room – I resorted to using my wok. While the turkey cooks, peal and chop your onions. Once your turkey is cooked through, add the chopped onions and turn over with the wooden spoon to mix. While the turkey and onions are cooking, start chopping your peppers. Add your chopped peppers and the garlic to the turkey and onion. 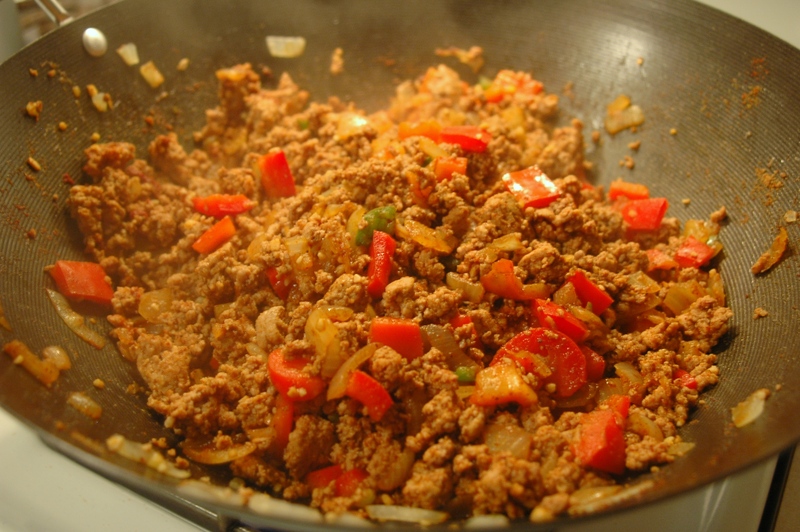 Then, stir in your spices – the chili powder, paprika, cumin, and coriander. Remember, when measuring your spices, one palmful equals one tablespoon! Lastly, add your chicken broth and tomato paste, and let it simmer on the stove until your potatoes are done (around 10 minutes or so). This chili would be good even by itself. But paired with the creamy potatoes, it's phenomenal. By now, your potatoes should be tender when poked with a fork (that’s how I know they’re done). Drain, and return to the hot pot or a large bowl to mix. Because I always love an excuse to play with kitchen gadgets, I use my electric hand mixer to mix the potatoes, margarine, sour cream, and orange zest (ooh! I get to use the zester too!). If you don't have an electric mixer, good ol' elbow grease can do the trick, too. I like to leave my potatoes a little chunky for pops of sweet potato. 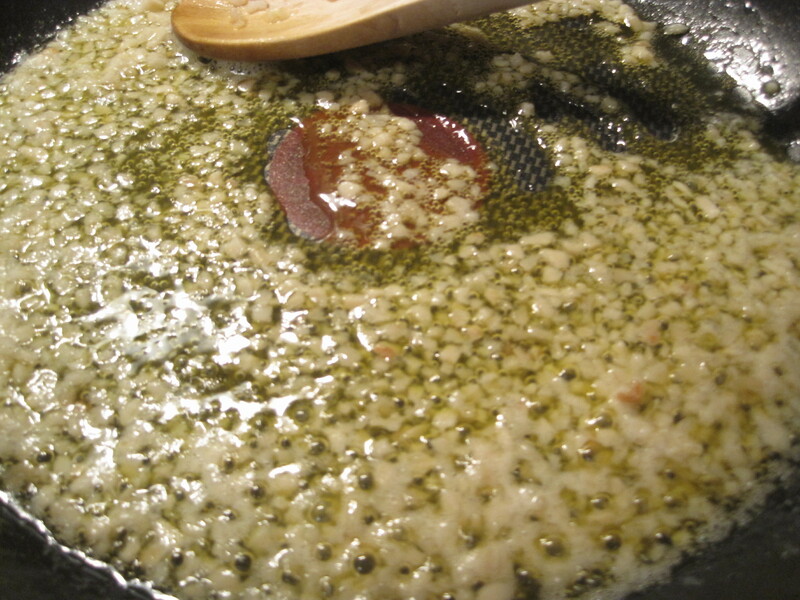 Prepare a 9×13″ pan by spraying with cooking spray. Then, smooth your potatoes on the bottom of the pan first. 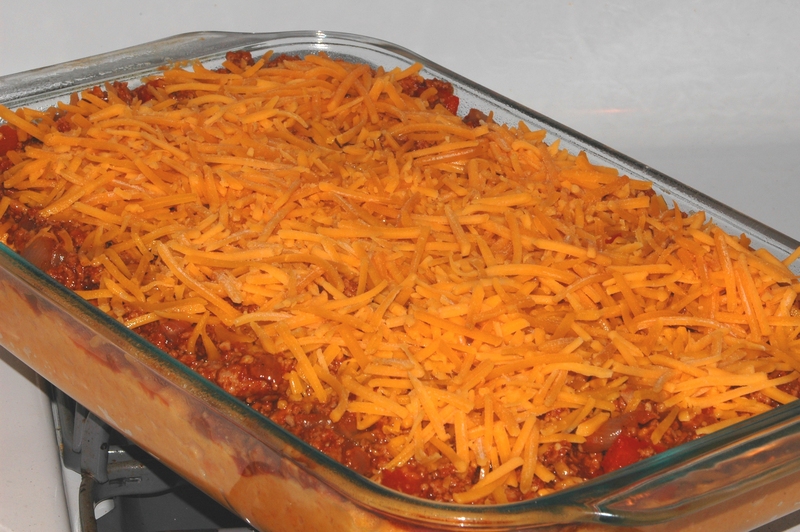 Follow by layering on the chili, and then top with the cheese. I can barely wait to dig into this cheesy, potato-y wonderfulness. Your shepherd’s pie is almost done! 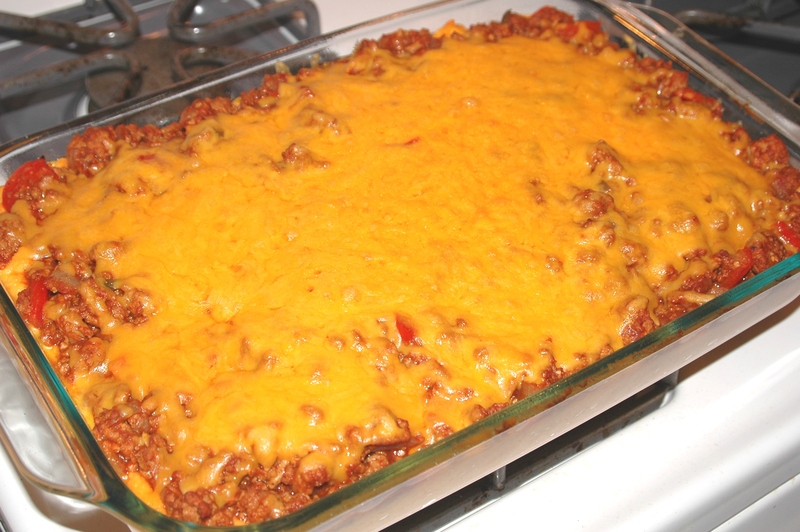 The last step is to pop the pan in the oven for about 5 minutes, or until the cheese bubbles. After that’s done, all that’s left is to scoop a giant heap onto your plate and dig in! I must give credit to Rachael Ray, who inspired my version of this dish. So in her words, YUM-O! While a more traditional red sauce is always good with pasta, a lemony-butter sauce is my no-contest favorite. This pasta is refreshing and light, while still tasting totally decadent. It’s made with all kitchen staples and only takes about 15 minutes to make, so it’s super easy to whip up any night of the week. It's tart, creamy, garlicky, and extremely delicious. After this easy treat, you'll never want to order in pizza again. First, get water boiling in your very large pot. While you wait, start defrosting your frozen shrimp. It’s super easy. Just put the shrimp in a bowl and run cold water over it, changing out the water every couple minutes. You can do this while everything else is cooking on the stove. Before you know it, the shrimp will be done. I think shrimp makes this dish feel extra special, but you can just as easily use chicken if shrimp isn’t handy. Side note on shrimp: Although I didn’t include frozen shrimp in my kitchen staples, you’ll often find a bag of precooked shrimp in my freezer to jazz up pasta, a salad, or an omelette. 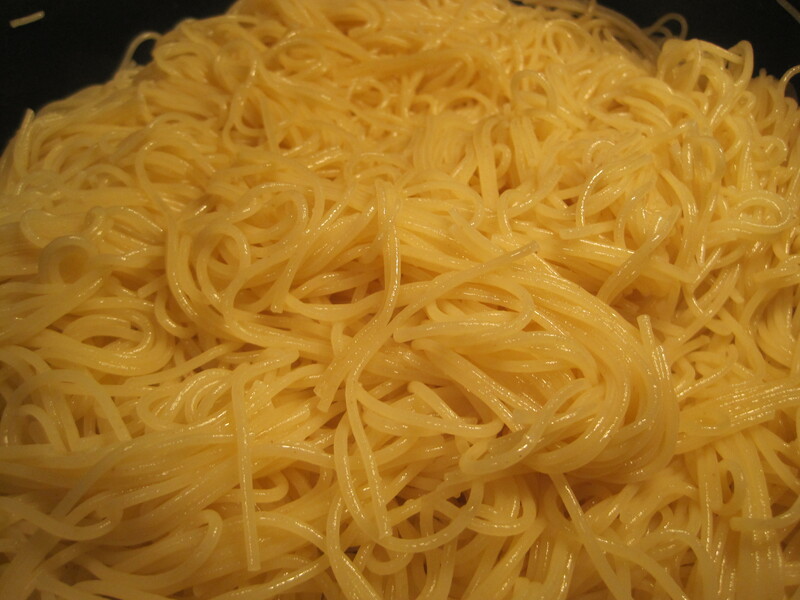 After the water is boiling, dump in your angel hair pasta. It only takes a few minutes to cook because it’s such a thin pasta, so keep a close eye on it. Once it’s done cooking, drain in a strainer and then return to the pot. Pasta tip: Toss the pasta with a couple tablespoons of olive oil to prevent the pasta from sticking. While you’re keeping a close eye on your pasta cooking, it’s easy enough to make this simple sauce on the next burner over. What you’ll need to do is put a medium pan over medium-high heat. Add the margarine to your pan, and once it starts to melt add the garlic. Let the garlic saute in the pan for a couple minutes. Be careful to not put your heat up too high or you'll burn the garlic. 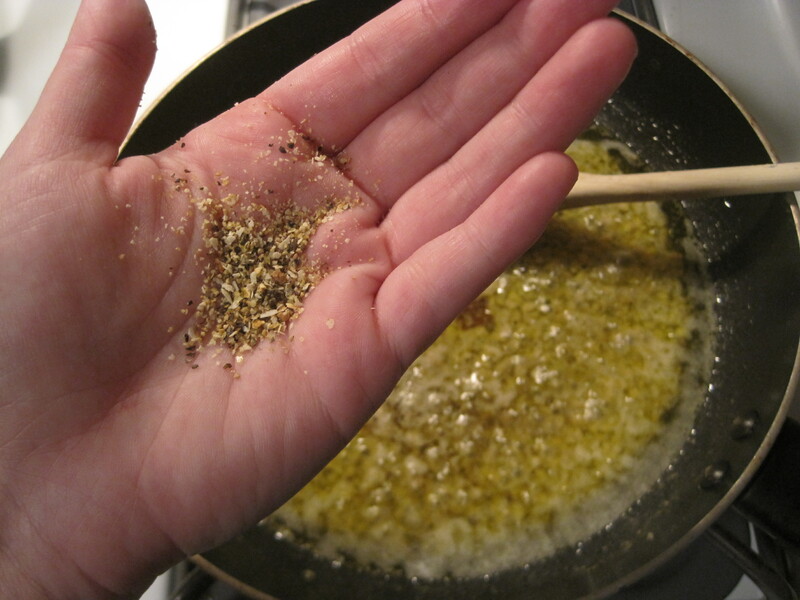 After the garlic is a nice golden-brown, add the lemon juice, olive oil, and lemon pepper. Let the sauce simmer over medium-high heat for just a minute to let the flavors blend together. Tip: I use my palm as a measuring spoon when I cook. When I cup my palm, half a palm-full is about 1 tsp. A full palm-full is about 1 tbsp. The best part about cooking (in my opinion) is that you don't have to be too exact, so have fun with it! And using your palm saves a dish, so it's a double-win. By now, the shrimp should be defrosted and the pasta should be ready to go. All that’s left to do is combine all the ingredients together. Toss the pasta with the sauce simmering on the stove. Then, add the Parmesan to your pasta, saving a little to sprinkle on the top. 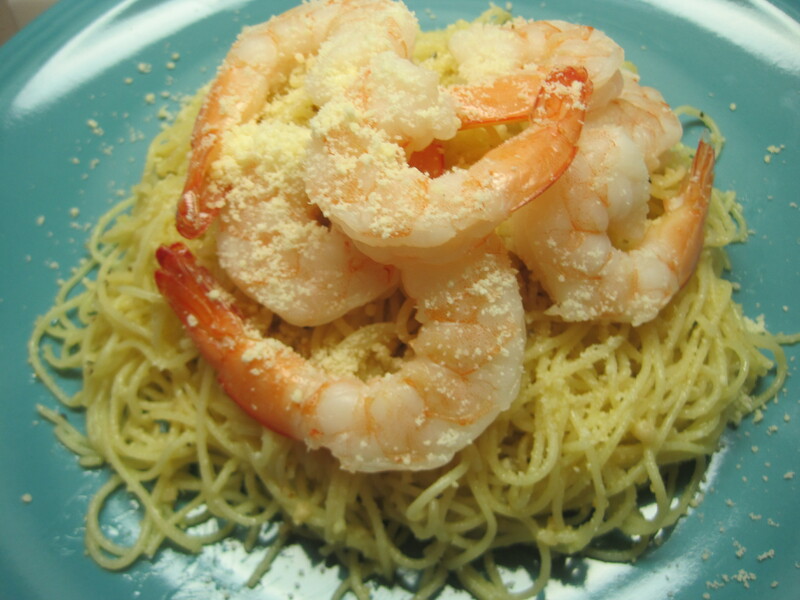 Scoop a giant mound of pasta on your plate, top with the shrimp, and then sprinkle the little bit of extra Parm on top. And buon appetite! A molto delizioso, 5-star Italian feast. While I walked home from work with Clinton today, I posed the question, “What do you want for dinner tonight?” A classic Thursday night question. I’ve been dominating the meals for the last couple weeks making some of my classic faves for the blog, so I wanted to give him the opportunity to put in his two cents. He answered, “chicken, veggies, and rice.” I’m not surprised, it’s one of Clinton’s favorite go-to meals. And of course, I know can easily whip up a fantastic meal with my classic kitchen staples. 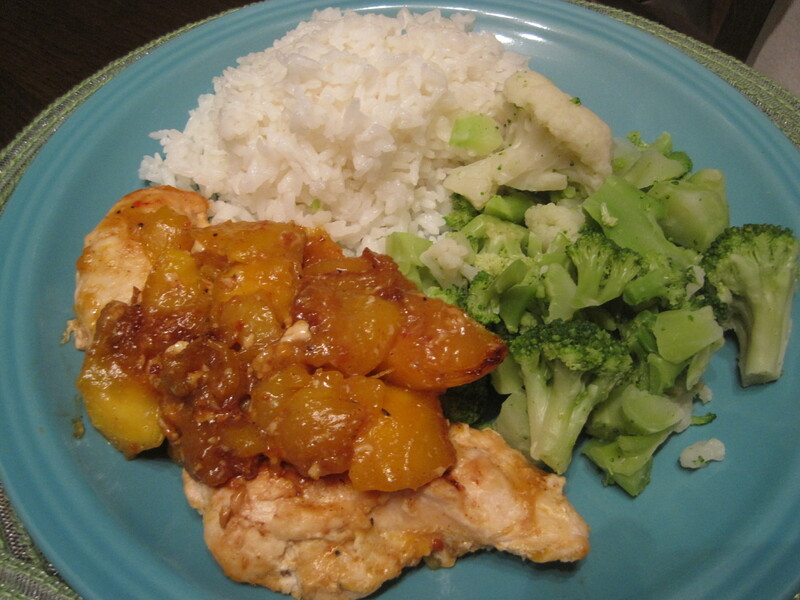 To change up my basic chicken recipe, I decided to go with a mango chicken. It sounds fancy, but it’s incredibly easy. It requires only two extra ingredients: frozen mango (which I’ve had in my freezer for a long time) and some sort of mango/peach/stone fruit marinade (again, something I’ve had in my fridge forever), which tonight is a spicy mango marinade. Both of those extra ingredients can last a long time, so you can whip out this meal any time you need another chicken change-up. Aside from those two extra ingredients, everything else comes from your kitchen staples, right down to your steamable veggies and rice in your rice cooker. Get that rice in the rice cooker. The ratio of rice to water is 1 cup of rice to 1.5 cups of water. Once it’s in the cook position, let’s start in on the chicken. Put your large pan over medium heat and spray with cooking spray. 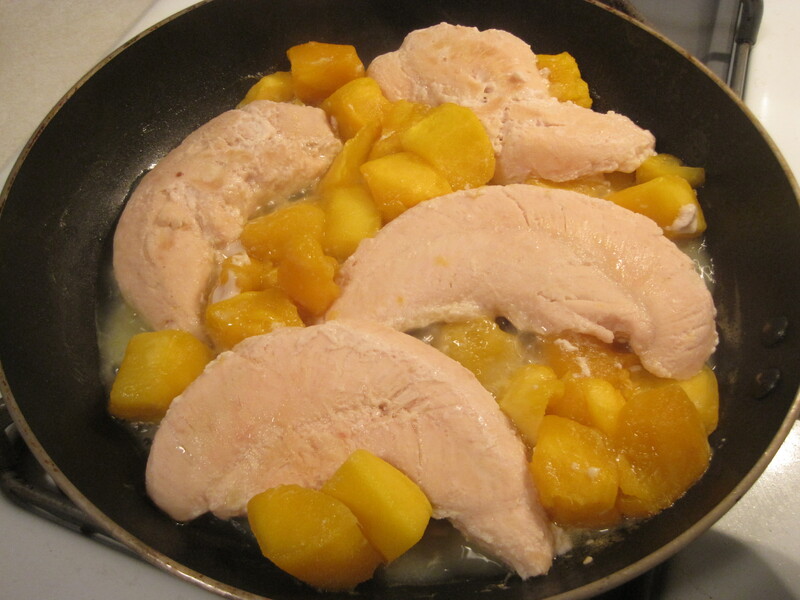 Put your frozen chicken and frozen mango in the pan. Don’t cover it with foil this time! There’s a lot more liquid in the frozen mango, so we’ll want that water to boil out. Cook for about 8 minutes over medium heat, then turn the chicken and cook for another 8 minutes (you’ll have a lot of downtime during this, so sit back and relax a bit!). The mango makes the chicken sweet and juicy. Not long after you’ve flipped the chicken, it’s time to get those steamable veggies in the microwave – I generally find that they only take about 5 minutes, but they can sit in the microwave for a bit if necessary. After the 8 minutes of cooking the chicken and mango on the other side, the water should be pretty much boiled out and it’s time to add the marinade. Add 2 tbsp to the pan and toss with the chicken and mango. Cook for another 2 minutes. Right about now, you should be hearing the pop of the rice cooker signaling the rice is done, the microwave beeping that your veggies are cooked. And voila! Dinner is served. A fancy, healthy meal good enough for any night of the week. I’m lucky because my parents aren’t picky eaters, and they raised my brothers and me to be the same when it came to food. You eat what’s served, whether it’s dark green, bright red, brown, yellow, or purple. 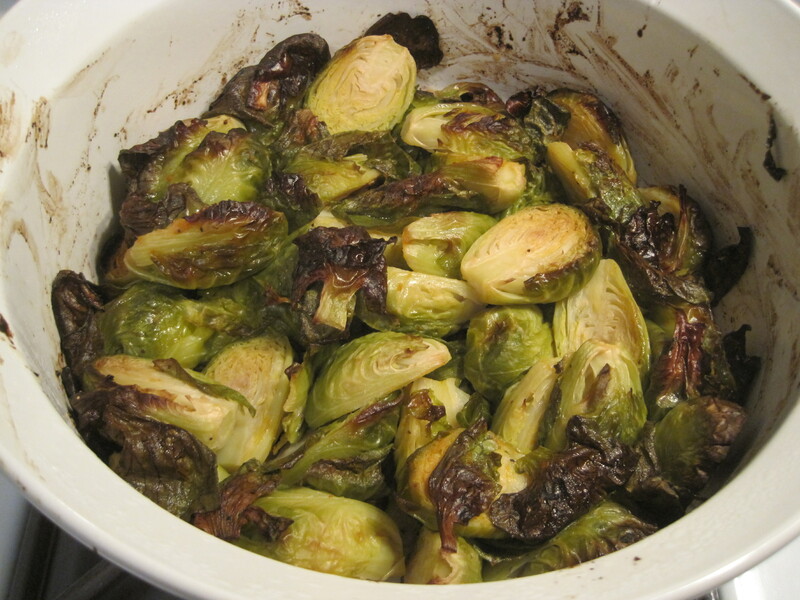 However, there were a few food items that I knew my parents disdained, and for my dad, Brussels sprouts topped the list. So for the longest time, I was afraid of cooking Brussels sprouts. Since they’re a food I didn’t really grow up eating, I wasn’t even sure I would like them. That is, until Clinton and I went to dinner at a friend’s apartment and our lovely hosts completely blew me away with this yummy veggie that I never knew had so much potential. So, Dad, I think I found a recipe for Brussels sprouts that I think even you would like. They're a little spicy, a little crispy, and extremely healthy and delicious. First, preheat your oven to 400 degrees. 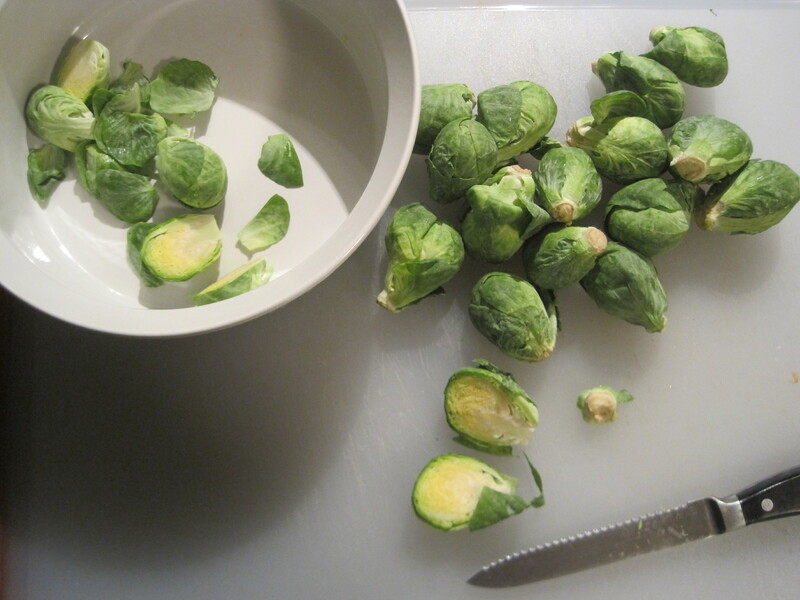 Then start slicing off the nub-like stem at the bottom of your Brussels sprouts, and then slice the Brussels sprouts in half. As I slice, I throw the sprouts directly in the baking dish. 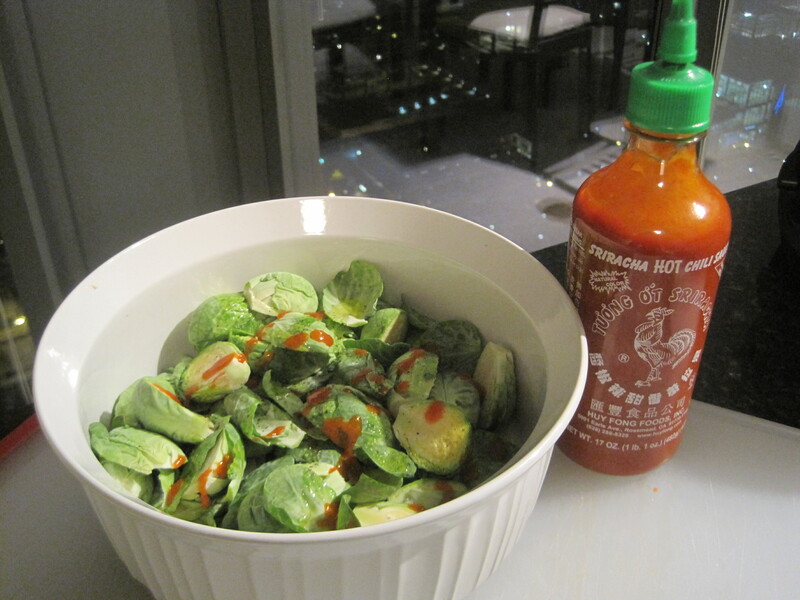 After all the Brussels sprouts are in your dish, drizzle with the olive oil, Sriracha, and salt and pepper to taste, then mix with your fingers to get the Brussels sprouts completely covered. I use about 1 tbsp of Sriracha, but I'm sensitive to spicy. The more spice you like, the more Sriracha you should glob on. Cover your baking dish and stick it in the oven for about 30 minutes. And that’s it! While it cooks, sit back and relax, or even make a yummy main course to go with it (see my post on chicken, as an example). It’s a super easy recipe that requires very little babysitting. What you’re left with is a super healthy, simple, and delicious side dish that’s great with any meal. Pictured here with a baked potato, recipe to come!